Our popular Celebration of Womanhood flower essences now have a masculine counterpart. The Gift of the Masculine Kit is a series of composite flower essences that we have been researching since 1994. 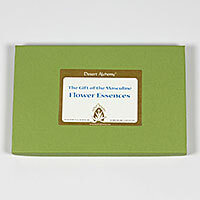 The purpose of these flower essences is to support awareness of and enhance our inner masculine qualities. In my own personal development, once I had consciously embraced my feminine nature, I felt that I wanted to enhance my inner masculine. Once my inner feminine was being honored, my inner masculine wanted to be brought up to date with her. The Celebration of Womanhood and Gift of the Masculine essences are not gender specific. The intention was not to create flower essences for men, rather to support masculine and feminine qualities for anyone. Both sets of essences are excellent for men and women alike. The Gift of the Masculine Kit contains the 12 composite formulas listed below. Each one of these essences can be purchased separately in 10 ml (1/3 fl. oz.) stock bottles. These 12 essences are also included in our Composite Formulas Kit of 47 essences. Full descriptions of each of these composite formulas can be found in our book, The Alchemy of the Desert, Second Edition. It includes research results, experiential stories and descriptions of the components that make up each of the formulas. This formula helps you activate your inner archetypal warrior and access courage, resolve and focused masculine energy to conquer your inner enemies and overcome obstacles, difficulties and shortcomings, so that you can be all that you can be. This formula has been shown to be a powerful way of releasing, at a cellular level, trauma resulting from physical abuse. It can release us from the fear of being touched and can restore our receptivity to physical touch and intimacy. It is an excellent aid for those recovering from physical beatings and from the abuse inherent in violent sports. This is an essence to help you move from your mind into the feeling level of awareness. It helps you perceive your emotions without judging and controlling them with your mind. It is excellent for excessively intellectual, as well as overly emotional, states. The formula inspires you to stay present, centered and aware through intense emotional states, without blocking or escaping them. A universally applicable flower essence formula to enhance understanding of the role of husband and adjust to it. It is also excellent for women who want to recognize and empower their inner husband or change their perception of what a husband can be. This is a formula to help us to manifest the archetypal inner king that each one of us has inside. The inner king can empower us with the qualities of dignity, nobility, justice, generosity, confidence, love, and respect. This essence can help men (or a woman’s inner masculine) to go beyond our societal models of man to create and manifest a new one. This composite formula is for those who want to be nice at any price. It helps us have appropriate and straightforward relationships based upon respecting and empowering others, rather than rescuing them. Life is a continuous re-creation. We are constantly learning, growing and re-creating ourselves. The archetypal sourcerer is he who has learned to transform and re-create. This formula helps activate this principle within us so we recognize that we have all the resources we need to re-create ourselves with fun and joy.